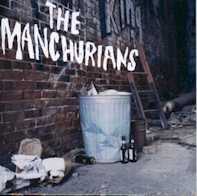 The original lineup for The Manchurians was Roger, his son Mat on drums and Mike Roth on guitar. 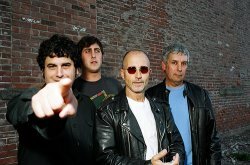 Sometime between their two CDs Mike Roth left the band and was replaced by Dean Falcone on guitar, and Bob Orsi appears to be a full-time member now. They've been described as Peter Green-era Fleetwood Mac meets Rory Gallagher meets Cheap Trick. 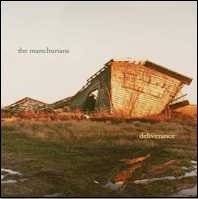 They record for ThinManMusic and the official web site for The Manchurians can be found there. They started rehearsing in mid-1999 and I believe their first gig was opening for The Reducers at the El 'N Gee Club on Thanksgiving weekend in 1999. 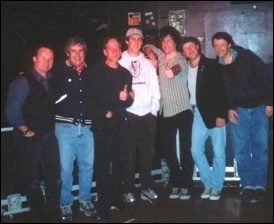 The photo to the right was taken after that gig (left to right - Mike Roth, Roger C. Reale, Steve Kaika, Mat Reale, Peter Detmold, Tom Trombley, Hugh Birdsall). Robert Orsi and Hilton Valentine, who play on "One For All", have also played live with the band on several occasions. Mat Reale also plays in another band, Base 2. The original working title of this CD was "Never Come Sunrise". Look closely at the cover of the CD and you'll see a copy of the Roger C. Reale & Rue Morgue "Radioactive" LP sticking out of the trash can. This CD can be purchased from IndepenDisc. You can read a great review for this CD at CTMusic.com. The track "Never Come Sunrise" is used in the Keifer Sutherland movie "Desert Saviors" (possibly renamed "Desert Saints"?). The original working title of this CD was "The Business". This CD can be purchased from IndepenDisc. 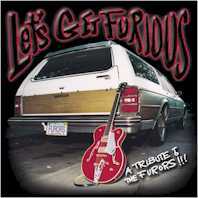 This tribute features 38 local bands from the New Haven, CT area covering songs by The Furors. This CD can be purchased from IndepenDisc. 1. A Thing For Blondes (The Furors) - ?:?? Sample audio files of some of the songs listed on this page are available in streaming RealAudio format. You need the RealPlayer software to listen to these files.